I read this book with all of the furigana covered with a card, and only checked it for 箱 and 雀. Those kanjis were used so specifically, and followed with such clear illustrations, that I was able to make out their definitions without looking them up. 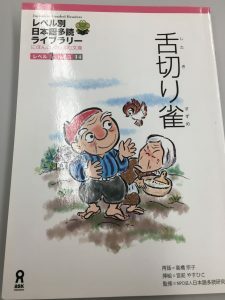 There was also 洗濯のり, which I couldn’t understand, but I understood from the illustration and the furigana せんたくthat it was some material for laundry. The story was very easy to follow, and there were a couple kanji from JPN 111 that I could recognize at this point. It’s pretty long, too, which means the story is a lot more developed and interesting. For that reason, I think it would be fun for students to tackle!